I’ve been working, and editing, and writing, and editing, and researching, and editing, pretty much non-stop lately. 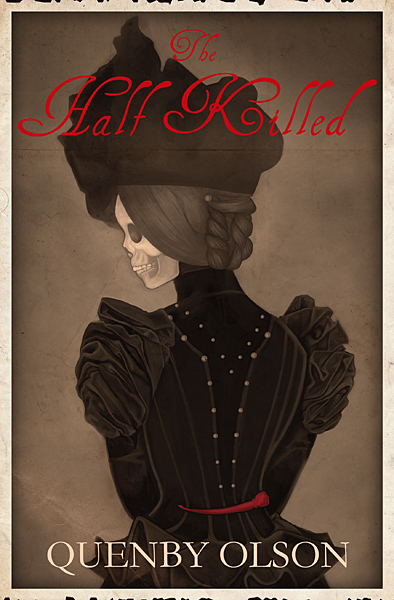 My next book, The Half Killed, is due out later this year. It takes place in the late nineteenth century, in London. A former spiritualist, Dorothea Hawes, is forced to contend with a series of murders – many of them connected to herself – and seek to find the culprit, who may or may not be of this world. And so, I give you an excerpt – a rather lengthy one! – of the first chapter. Okay, pretty much the entire first chapter. Because I’m nice like that. The body doesn’t move. I don’t expect it to, and yet I’m transfixed all the same. My eyes search the thick block of a neck for the slightest vibration that would indicate a flow of blood beneath the skin. The skin itself is enough to intrigue me, cast in a pallor that no virulent illness could begin to imitate. It is this shade, this absence of color that makes the deep bruises beneath the jaw stand out, curving in a mockery of the smile that still graces the frozen features of the dead man’s face. A push from behind forces me to take a step forward, my heel slipping on the greasy cobbles. It is a small group of onlookers gathered around the scene, but no one lingers for more than a passing glance. The poor man has nothing to recommend him. See there? The scuffs on his boots? And look at the patches on his coat, the fabric worn so thin it could lead a double life as a strip of cheesecloth. And what about his face? Oh, it’s not a handsome one. A face that could earn naught but a mother’s love, as is often said. And so the pedestrian moves on, their pace quickening until the shout of a seller or the rumble of a passing dray erases the memory of the dead man from their mind. I know that I shouldn’t stay very long myself. Another glance from the constable, and I wonder if I’ve already worn out my welcome. His uneasiness grows the longer I stand here, and when his partner finally joins him, there is a great deal of whispering, punctuated by more than a few looks in my direction. Not only because I’m a woman, surely. But because I am a young woman, modestly dressed, wandering the streets before the first rays of the sun have touched the dome of St. Paul’s. And most shockingly of all, because the sight of a recently deceased man sprawled across the edge of the pavement does nothing to disturb my feminine sensibilities. And why should it? There’s nothing particularly gruesome about the scene. No blood, no other visible marks or wounds apart from the row of dark bruises beneath the unshaven jaw. If the eyes weren’t open, gazing up at the channel of brightening sky, I could almost fool myself with the belief that he had simply passed out, that any moment, he’ll groan and grumble back to life, waving his hand to clear away the inebriated haze that settled on his mind some hours before dawn. But he doesn’t move, and one of the constables takes the liberty of borrowing a tarpaulin from a local shopkeeper, the better to shield the inert form from view. Move along, my mind tells me. Nothing more to see. And though I’m tempted to argue, I put on my best show of moving on, of slipping into the crowd and allowing their rapid pace to carry me back toward home. I don’t talk much about being a mom. That doesn’t mean I don’t talk about my children. I talk about them ALL THE TIME. I’ve no doubt I’m swiftly becoming one of Those Women that people hate, the kind that uses every other Facebook update to quote something absolutely adorable said by one of their children, or to remark on one of their most precious of little quirks, or to wax poetic on how their children are the greatest children to ever grace the planet and when they cry it is to produce crystalline tears that fall on the ground and replenish the earth with all of their life-giving properties. But I don’t really go very much into what it’s like to BE a mom. And that’s mostly because… well, I can’t. So how do I even begin? Where do I begin? It probably helps (or maybe it doesn’t help at all and the hormones currently racing through my body are making me CRAZYPANTS all over the place) that I’m still nursing my third child. So all of those things I mentioned above? The frustrating bits and the perplexing bits and the astonishing bits? Yeah, I’m dealing with those in spades. So back to the beginning. You’ve gone through the pregnancy, you’ve picked out names and nursery colors and oohed and aahed over all the cute baby clothes and imagined how wonderful it will be to be have your child in your arms, frolicking through the dew-touched woods with the other nymphs and sylphs as you embrace motherhood and nursing while just imagining how great a mom you’ll be and how you’ll never give your child sugar or a pacifier or jarred baby food and you’ll wash out every single cloth diaper (woven from the silken threads of magical tree elves who only use chlorine-free material recycled beneath the waxing light of a gibbous moon) with your bare hands and it will all be MAGICAL, truly MAGICAL. No. No, it won’t be. It will be scary. At least, that’s the first thing I experienced. And not because I was suddenly in charge of a squalling little ball of baby acne and screams that threatened to punch the nurses in the face when they tried to weigh her at the hospital. It’s also because after nine months of dealing with nausea, exhaustion (I’d say “fatigue”, but seriously, that word sounds so dainty and ladylike, and there is nothing ladylike about snoring loudly while drool collects on your chest and you’re still wearing the same clothes from two days ago because the thought of opening a drawer or turning on the faucet to take a shower is more than enough to make your muscles ache), contractions, midnight hunger, swelling, hot flashes and 5,000 other less-savory symptoms that I won’t take the trouble to name here, I then went through over fifteen hours of back labor, several hours of pushing, and all to bring my crying little pugilist into the world. So… imagine having the flu, and then being beaten with a sack of rocks. And then someone hands you a baby. Yeah, that’s pretty much your first exposure to motherhood right there. And so I foundered. And I cried. I also didn’t sleep, I didn’t eat, until at the end of the first week at home with my oldest daughter, I dropped her into my husband’s arms, locked myself in the bathroom, and refused to come out. Because it wasn’t MAGICAL. I wasn’t dancing with wood-nymphs or weaving flowers into my hair or planning out organic, GMO-free menus for the months ahead when my child would begin eating food. I bawled, and ate my own meals like someone who had been born without taste buds, and all while rambling around the house in the same pajamas I’d worn for a week, smelling like sour milk and I-don’t-want-to-know-what-else. So… being a mom. That’s just a little bit of what it’s like, or at least what it’s been like for me. And that really only touches on the first few months. That’s not even covering first words, and baby-proofing, and potty-training, and lots of other things that may or may not need to be hyphenated. My oldest daughter will be five years old in September. My second will be 3 1/2. My third, a boy, just turned one. And no doubt at some point in the future, we’ll introduce another little one into the fold. And I’m sure that I’ll be just as tired, just as frustrated, and just as smelly all over again. But with a good bit of that GREATEST LOVE mixed in with everything, too. I definitely can’t forget that.